As I’ve said before, we adore carrots in all their myriad forms here at Rivertree Kitchen. I’ve cooked them with honey and chiles, tossed them in with a roasting chicken, shredded them into Thai peanut noodles, even baked them in a cake. The thick, creamy texture of Greek is a perfect– and healthy — sub for mayo. I liked the tang it brought, but balanced it with a touch of honey (instead of white sugar) and a pinch of salt. A little herbal greenery in the form of flat-leaf parsley, and an optional tickle of heat via Aleppo pepper, and we’re done. The result is crunchy, slightly sweet with a subtle kick. Feel free to play with proportions. I’m a minimalist when it comes to dressing, so the amounts listed here are just enough to moisten the carrots. Double the amounts if you want a creamier salad, or even stir in a spoonful of mayo; I won’t hold it against you. Add a handful of raisins, dried cranberries, or dried cherries. In a medium bowl, whisk together the yogurt, honey, salt, and Aleppo (if using). 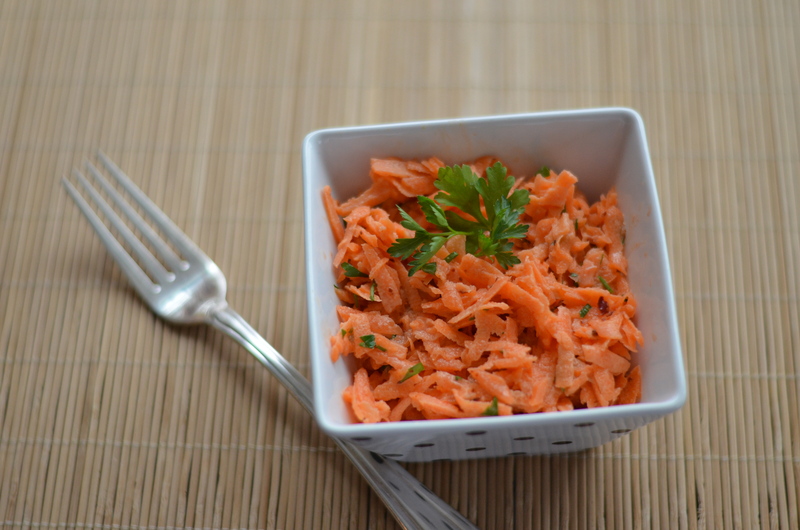 Stir in the carrots and parsley. Best eaten within a few hours. This entry was posted in salads, sides, veggies and tagged carrots, greek yogurt, healthy, sides, vegetarian, yogurt. Bookmark the permalink.